Resolute is pleased to announce that we were awarded contracts for 2 projects at Cambridge Village-Apex Campus. One is for an expansion to their existing facility, adding additional units; and the other is for interior renovations and an addition to the clubhouse. An early-January start is anticipated. Special thanks to Patrick Rowe who led the preconstruction effort and brought this project from a vision to reality! As we reflected this past Veterans Day, remembering all those that served our country in the past and those currently serving, special acknowledgement and thank you goes out to our Resolute veterans, which include, but may not be limited to: Tom Bennink, Casey Lasek, Leroy Haskins, Randy Grubb, Reubin Gillis, and Dan Shields. Many thanks! 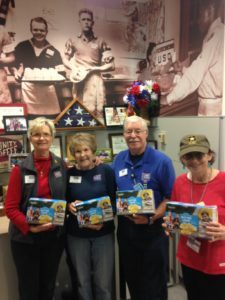 As everyone prepares for this special Thanksgiving season, and taking time to think about what you and we are all “thankful” for, as part of Resolute’ s continued commitment to “give back” to others and show our “thanks”; today, on behalf of our Resolute Family, we presented 12 cases of popcorn to the USO at RDU Airport for them to distribute to our soldiers and families over the holiday season. Wishing all an enjoyable and restful Thanksgiving weekend and for those of you that are traveling, please be safe and look out for each other! Resolute Building Company was awarded the contract to provide another SECU facility. This one will be in Sanford and will be another prototype of the one we are finishing in Hillsborough. Special congratulations and thanks goes to the project team, Philip Crosby, Doug Kirk, Kathy Harding, and to the estimator for this new project, Ryan Plankenhorn. We are waiting for the building permit before we announce a start date, but we anticipate we should break ground on or about 12/1/17. We are pleased to announce that Leroy Haskins joined our team on October 30th as Superintendent and will be working in conjunction with Dan Shields on the recently awarded Fayetteville Airport terminal renovations, as that project ramps up to start the first week of December. Welcome, Leroy, to the Resolute team and Building Better! 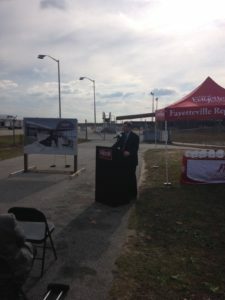 Resolute was awarded the contract for improvements to the Fayetteville Regional Airport Terminal 1 improvements earlier this fall, and on November 14th attended the “wall breaking ceremony”, in anticipation of the NTP, which is expected the first week of December. We are pleased to announce the hiring of Diana Mahaley. Diana joined our accounting team 11/6/17 and will share responsibilities with Monica Jones. Welcome, Diana, to the Resolute team and Building Better! We are pleased to announce the hiring of Paul Fox, Superintendent, who joined un on November 6th, to work on the Shelton Station Project in Carrboro. Welcome, Paul, to Resolute and Building Better! 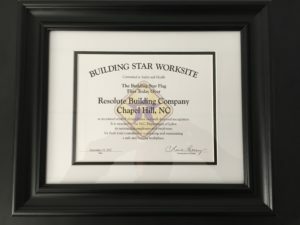 On Friday, November 17th, at the Brannan project in Durham, North Carolina, Resolute Building Company was presented the Building Star certificate and banner by Labor Commissioner, Ms. Cherie Berry. See below the project team that was responsible for working with Tony Jordan and DLB to achieve this major recognition! In addition to Ms. Berry, Dave Simpson, President and CEO of the Carolina’s AGC, also witnessed the presentation of this award. He was very complimentary of what Resolute has accomplished over the recent years and how we, as General Contractors in the Carolinas, truly are making a difference in the industry! Special thanks to Tony Jordan for leading and at times pushing this effort over the past year. Congrats again to everyone involved with this and my thanks to each of you that had a hand in putting Resolute above the rest by Building Better! Congrats again to everyone involved on this achievement! AGC website in both North Carolina and South Carolina.